Arctic is a bare bones, gripping story of survival in the desolate cold. It is simple, beautifully shot, and elegant in its portrayal of man’s fierce determination. Cinema today is overblown and wrought with superficial special effects. It’s rare to see a film so elemental, yet deeply spiritual and moving at the same time. Arctic is a brilliant feature debut from director/writer Joe Pena. He allows the pristine wilderness to be the star, reminding us how unforgiving nature can be. Arctic begins with our protagonist already stranded. 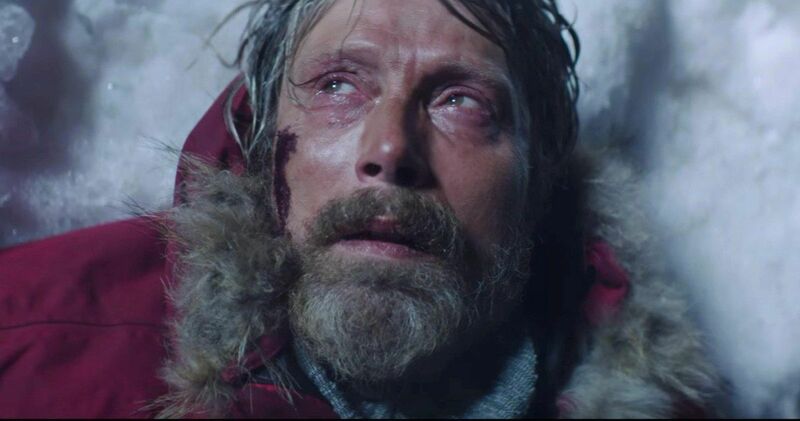 Danish actor Mads Mikkelsen stars as Overgard, a crashed pilot who’s already suffered injuries from the cold. He’s made a crude shelter from the remains of his plane. He’s dug holes in the ice and set-up fishing lines for food. Every day he hikes to a different peak, lugging his emergency beacon, hand-cranking it for hours at a time. Overgard’s situation becomes vastly more complicated. He’s forced to make a life or death decision. A polar bear has become familiar with his camp. The animal is aware of his fishing lines. Overgard decides to make the trek to a remote science station. It is a far, dangerous journey through mountainous terrain. He must carry everything he needs to survive, and the result of a failed rescue. Overgard embarks on a last ditch effort to survive, with the brutal cold and a dangerous animal as constant threats. Mads Mikkelsen gives a tour de force, immensely physical performance. His character says almost nothing throughout the entire film. Scant dialogue is an understatement. We see Overgard carefully measure and weigh everything he does. He can’t gobble down all of his fish, no matter how hungry. He has to budget every supply. The same goes for his rescue efforts. How long and far can he take the transmitter? Overgard plots every movement meticulously on his map. Every step away from the camp is one he must make to get back safely. The final decision to leave terrifies his wind blasted face. Mikkelsen will have you glued to the screen. Everything he does has meaning. Joe Pena makes you feel the bone chilling cold. The arctic is the primary character in his story. There are stunning shots of vast emptiness. Snow whirls down peaks as Overgard trudges defiantly on. The beauty of pristine white snow tempered by the shadowy outlines of the polar bear. Is the creature following, or is Overgard just paranoid? It could literally strike at any moment. Arctic has a stark realism that grabs you from the opening frame and never lets go. The environment is the first consideration in everything Overgard does. Arctic has a similar feel to Robert Redford’s brilliant All Is Lost. That was survival at sea, but the tenets of both films are the same. Man versus nature, where failure is certain death. Arctic has a brisk runtime that keeps the survival drama squarely in focus. There are a few surprises that propel the skeleton plot forward. I was mesmerised by this film and the incredible performance of Mads Mikkelsen. Don’t walk into Arctic expecting any bells, whistles, or excess. It’s as straightforward as filmmaking gets, and a reminder how less can be so much more when done correctly. Arctic will have a limited release by Bleecker Street Films. It’s absolutely worth finding a theater to see this captivating film.